New to Traveling and New to the Blogroll! 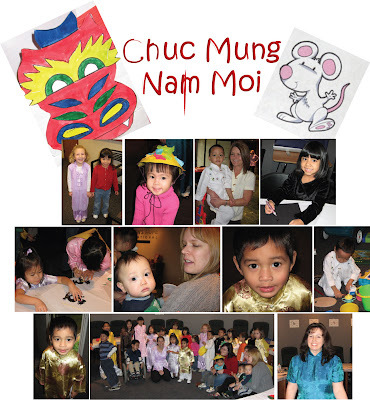 On February 16, 25 families from the Midwest (with a total of 36 kids) came together at the St. Louis Children's Hope headquarters to celebrate Tet, Vietnam's biggest holiday of the year. Kids had a blast creating dragons and Vietnamese hats for the New Year's Holiday. Kids and their parents went from one craft station to the next, all set up by moms Tashi Frey and Sarah Smith. The Wall family of Missouri also posted photos of the fun event! Did you celebrate with your branch office or at home? If you've blogged about Tet, comment and let us all know. On Friday I released a Children's Hope logo banner. The logo links directly to Children's Hope main web site. Families may display this logo banner to announce Children's Hope International as their agency, graphically on their sidebar. Friday's logo had a clear background. Unfortunately, it was difficult to see on darker blogskins. Today, I have uploaded a logo with a white background, which is more visible. Find it here! As WW requested, the below logo banner is for 3-column blogs or those with thinner sidebars (150 px). Also, just before Christmas, Children's Hope began promoting 'Gifts for Good'. There are many ways you may donate to orphans left behind just by using your normal shopping habits. When you are shopping at grocery stores, you may feed both your family and malnourished orphans. Shop through Charity Blast at Target or Wal-mart, at hotels such as the Radisson, or even at specialty stores like Sephora, Netflix or Petco, and a percentage of your purchase may be donated to Children's Hope. Their list is quite extensive. Click on the 'Gifts for Good' logo for more details or click on 'Want this badge?' to upload your own blog banner to help spread the word. You'll see the uppermost links on the Completed Families Blogroll are all new to the list. This is great news, with an addition to the blogroll and two families just home, including the Armstrongs from Colombia! Congratulations to all of our families as they settle in together as a completed family. 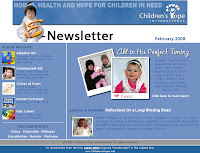 Welcome to the Guided Tour of Children's Hope February E-news! Every month we feature a great family story. This month, you'll hear from Danielle Riddle. Through the mouth of her adoption judge, this mom adopting from Russia discovered her miracle. Home through the holidays and a first birthday, Danielle was able to experience life anew with her new daughter drawn close in her arms. It was perfect timing. We also share a chosen Blog of the Month- this month a family who is currently traveling in Ethiopia for her son, just as you read this! Read her adoption story - one of taking risks and moving forward with inspiring faith. From one adoptive parent to another, Parent-to-Parent's Jean MacLeod shares topical wisdom garnered from parenting three daughters, two of whom were adopted through Children's Hope from China, and through co-editing one of the most comprehensive adoption parenting books available today, Adoption Parenting: Creating a Toolbox, Building Connections. Most of you will remember Karen Taylor's video of Children's Hope - China's Hope Center. 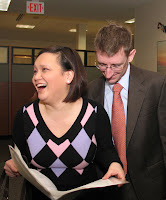 On January 31, I promised details on Karen's volunteer trip to China in the February e-news. You'll find that promise fulfilled in this month's Development Aid feature. Special to the E-news this month, our print newsletter contributor and Adoption MD, Dr. Christine Poulos, shares on a topic not often-enough discussed in international adoption. Seventy percent of Children's Hope families battle infertility and often subsequent depression. From her personal experience, Dr. Poulos shares how you may beat depression, sans antidepressants. I told you this issue was packed. There's still more! Our Kids Corner comes at you every month with kid-friendly activities and recipes for something fun for our families with kids at home. Have kids and waiting to adopt? Visit this page together with your children...any activity here - either cultural or timely - will remind them their new brother or sister is coming soon! Our church volunteers saw the great impact of the Christmas Tree of Hope project. But you don't have to be a CHI church volunteer to get involved in the specially featured 3 Days of Focus. Speak with your church youth pastor about helping teens turn off their iPods and PSPs and turn on their focus on God. Their faith will be impacted and their minds opened to helping third-world villages receive water, orphans receive life-saving surgeries, and much more. The incoming generation will be a generation that sees the world as it is and changes it for the better. Help make it happen. And of course, you don't want to miss the opportunity to get updates on your country program. Maybe the best part? Pictures from families already home! You'll love seeing their happy faces every month. Now you're in the know. Check it out! Children’s Hope families and China’s waiting children – orphaned children who are older or have special medical needs – are all benefitting greatly from the CCAA’s newly implemented, electronic Information System. What’s different? One Children’s Hope family in 2007 placed a Letter of Intent to adopt a waiting child. The family’s dossier had already been logged in by the CCAA and approved for China’s international adoption program. When they applied for a specific waiting child on July 6, this family’s adoption paperwork was waiting in Department 2. Six weeks later they received their official referral for the child, by way of the CCAA’s Seeking Confirmation Letter. Referral Day! This is very exciting for the waiting children of China as they are brought into their forever family in a much timelier manner. Also exciting, the same speed has been applied to those families whose dossiers are not yet completed or logged in but not yet approved by at the CCAA. In 2007, these families without a log-in-date could expect to receive their Pre-Approval after submitting their Letter of Intent 4 weeks to 3 months later. 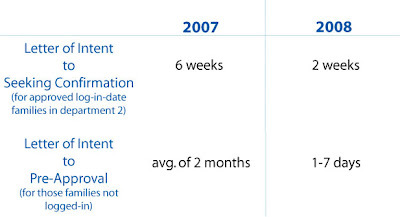 In 2008, with the new system - our families have received Pre-Approvals within a day to a week! “Our families and the multiple-agency kids*, especially, are really benefitting from this new system. The kids, the families – neither have to wait as long to become a family,” says Adoption Program Director Ann Tollefson, with a big smile. Children’s Hope loves the new CCAA information system for waiting children! • It is too early to approximate timelines of Seeking Confirmation Letters receipt for families not yet logged-in. • Multi-agency waiting children are harder to place children. These orphans are viewed by multiple agencies concurrently, and in turn are seen by more prospective parents. Six of these children have been placed with Children’s Hope families this month. We are especially excited for these children. Congratulations! Eight referrals for Ethiopia families! The Ethiopia program received eight referrals yesterday for Children's Hope families! We are happy to announce that three boys and five girls were referred to families; these children were matched with prospective families and their adoption will soon be reviewed by Ethiopian courts. These referrals include two sibling groups of two and all range in age from 2 months old to 7 years old! Our current longest waiting family for a referral has waited 5 ½ months. Congratulations to our referral families! Fifteen families will come home from Ethiopia this month, having completed their international adoptions overseas, ...and the Mackenzies were one of them. When Chris and Leigh came into the St. Louis airport on Monday, they were welcomed by their daughter Isabella's two new grandmas, one in from Illinois and the second in from Colorado, and one very excited new brother Julian. Happy homecoming and happy Valentine's Day, to this united family! Thank you for sharing this day with Children's Hope. Seven families are home so far from Ethiopia this month. In March, two families are currently expected to travel from Children's Hope International to complete their adoptions in Addis Ababa, Ethiopia. The Bilbro's have a new blog address and exciting news! It is exciting to see so many families traveling and preparing to travel! Congratulations to all of you! Thank you for all the donations pouring in from CHI families and supporters! Most of the affected areas in Southern China are receiving better weather and the snow is melting. Our staff in China are in daily contact with the orphanages and hope to hear of improvements in electricity and water availability, along with a drop to normal pricing levels for daily goods. Please check Melody's blog, www.melodyzhangorphans.blogspot.com, and our Development aid site, www.helpanorphan.org, for the latest updates. Last night, 1.5 billion people celebrated Chinese New Year's Eve with one hour of nonstop fireworks, aired on Chinese national television. Radios were donated to the people in disaster areas so they, too, could listen to the show as the country celebrated their biggest holiday of the year. Happy New Year to all our China families! • New blogs will be added on Friday with more Traveling Family transitions! Many of our families are eager for information on China's current blizzard situation which was officially announced a disaster by Chinese government, and is earning the nickname 'China's Katrina'. Children's Hope is working with 13 orphanages to fill their urgent needs. The needs are simple - disposable diapers, air conditioners to act as much needed heat sources, and funds to cover the increased costs of daily goods. Because of the loss of transportation, local prices have increased dramatically and normal needs are not being met. Updates are being translated from Children's Hope - China's web site, and Melody is posting information on her blog, which is then also posted on our Development Aid web site. Children's Hope is supporting these orphanages, but a disaster fund was not in place. To offset money already given and to provide for those orphanages which funds have not been met, any family touched by these orphanages' situation may donate online, by credit card or electronic check. Earmark the funds in the box 'Additional Information' by donating for 'South China Emergency Fund'. * Pictured: A doctor from CBN's relief team visited the Chenzhou Orphanage and called Melody to update her on the orphanages status and seek advice. This orphanage is still without power and some of the babies have been becoming ill due to the cold. Eleven Families Adopting From China Celebrate: Referrals! Thuy and David Smith (pictured, left) of St. Louis, MO, along with 10 additional Children's Hope families adopting from China celebrate today as their referral day! These eleven families saw pictures and reviewed medical information on their new child for the first time. Each family was matched with one of 9 beautiful little girls and 2 handsome little boys from the Gansu, Guangdong, and Jilin provinces and Tianjin City. These infants range in age from 7 - 15 months and 24 - 28 months. Today's referrals were for our families whose paperwork was registered in China on December 20, 2005; the families waited 25 long months from their paperwork receipt in China to this referral day. The happy parents will now travel to China in about 8 weeks to complete their Chinese adoptions. Congratulations to these families and all our China families who have moved up in line. Happy Chinese New Year! Children's Hope Melody Zhang has sent posts for her blog this morning, detailing the urgent needs of 10 southern province orphanages hit by the relentless snowstorms in China. Children's Hope is working with these orphanages for their emergency needs, and aiding coordination with CBN and Half the Sky. Funding for four of the orphanages has not yet been met. 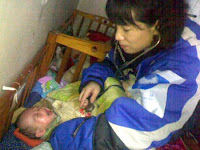 Visit her page for details on these orphanages and their current conditions, http://melodyzhangorphans.blogspot.com/.